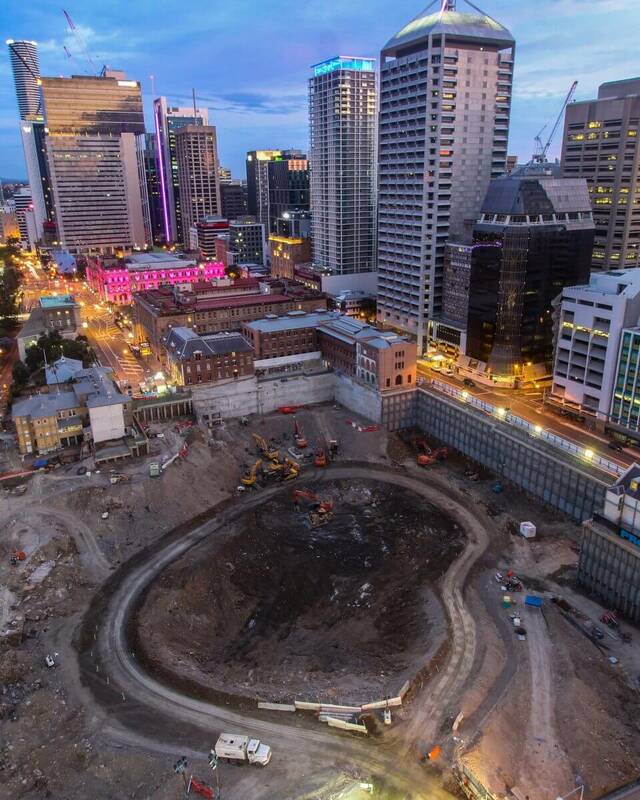 Brisbane CBD’s biggest hole in the ground hit the half way mark in November, with 225,000m3 of material removed from the precinct which will house the $3.6 billion Queen’s Wharf Brisbane Development. The earthworks, which began in March, are for a 26-metre deep, five-level car-park basement that will service the entertainment, dining and tourism development when it is due to open in late-2022. Destination Brisbane Project Director Simon Crooks says the excavation work is expected to be complete by August 2019. “The former basements and footings of the Executive Building and Annexe have been removed as well as around 225,000m3 of bulk excavation material,” Mr Crooks said. “That’s equivalent to around 90 Olympic swimming pools. Mr Crooks said excavation peaked in August with 3,400 truck movements recorded across the month during the combined night and day works. “Having reached halfway, this next phase of excavation is where we expect to hit bedrock in early 2019,” Mr Crooks said. “This will be Brisbane Tuff – the same rock as the Kangaroo Point Cliffs, and for which tunnel boring equipment is often used. “Instead, our contractor Probuild plans to use low levels of explosives to finely crack the rock ahead of excavation. “The method is not new to Brisbane’s CBD. It directs force downwards, reducing noise, reducing the risk to people or buildings nearby, and it should help speed up this next phase, while also reducing the amount of excavator operated rock breaking work required. Construction of the Integrated resort will commence in 2019 once the excavation is complete. The tender to build the shell and core of the integrated resort development closed in October 2018 and Destination Brisbane Consortium is working through the decision making process now, expecting to announce a successful contractor around March 2019. To learn more about Queen’s Wharf Brisbane, visit www.queenswharfbrisbane.com.au and/or our Facebook page www.facebook.com/queenswharfbrisbane/.